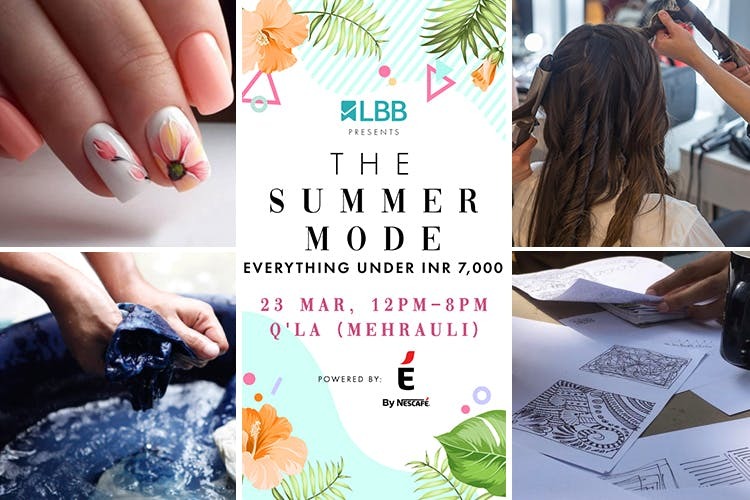 Complimentary Manicures, Blow Dries And A Shibori Workshop; Reasons Why You Shouldn’t Miss The Summer Mode Powered by É by NESCAFÉ! We cannot begin to imagine the scenes at Qla on March 23! Summer is almost here with cool breezes and we’re ready to have some real fun under the sun. The excitement levels are soaring higher everyday with each brand bringing out its best foot forward. While there’s no doubt that we’re getting you some of the best contemporary brands under INR 7000, potent cocktails and fingerlicking food, here are some more exciting things you can look forward to. Holi is around the corner and all we want to do is to play with colours. Hit register and sign up for a Tie and Dye workshop with Label by Rinchen Ghosh. Join us splash some colours on scarves and take your masterpieces home with you, all of this will only cost you INR 100, so think no more and get ready to create some beautiful indigo scarves. Become a top shopper at The Summer Mode and treat yourself with a manicure by Bblunt! Yes, ladies we are giving you all the reasons to step out and soak some much needed vitamin D as you stroll across the lanes of The Summer Mode Powered by É by NESCAFÉ with a cocktail in one hand and shopping bags in the other. Stop by at the Bblunt Manicure bar and treat yourself with a relaxing manicure session before you get back to hauling everything from the best indie brands. What’s a good hair day without a blow dry? An average day out in the city. Let’s change that to epic this Saturday because The Summer Mode Powered by É by NESCAFÉ will not only make you feel good but also look good. Shop to your heart’s content and score a blow dry session under INR 100 with the experts from Blobar. They will help you look just the part before you post something on your gram! We have spent our childhood doodling on walls and getting scolded for doing the same. At The Summer Mode Powered By É by NESCAFÉ, we are giving you a huge wall where you can doodle your way to glory with Doodke Kit Project. So if you’re someone who cannot get enough of those satisfying doodle videos on Instagram, here’s your chance to try your hands at it. Drop by at the doodle corner at any time of the day, pick your tools and join Doodle Kit Project in creating a huge doodle wall! From manicures and blow dry sessions for ladies to potent drinks for men and doodle wall for kids (and you), The Summer Mode Powered By É by NESCAFÉ houses a day full excitement for everyone! Block your calendars and RSVP right away.